Today, I want to talk about my favorite things I get at Costco. We already talked about how I save money at Costco, but there is more to this. I love to know what people buy at places! I might be the weird one, but I even like to see grocery hauls. They either make me feel like I buy too much or not enough. So, the first thing you should know is our grocery budget is $300 every two weeks. 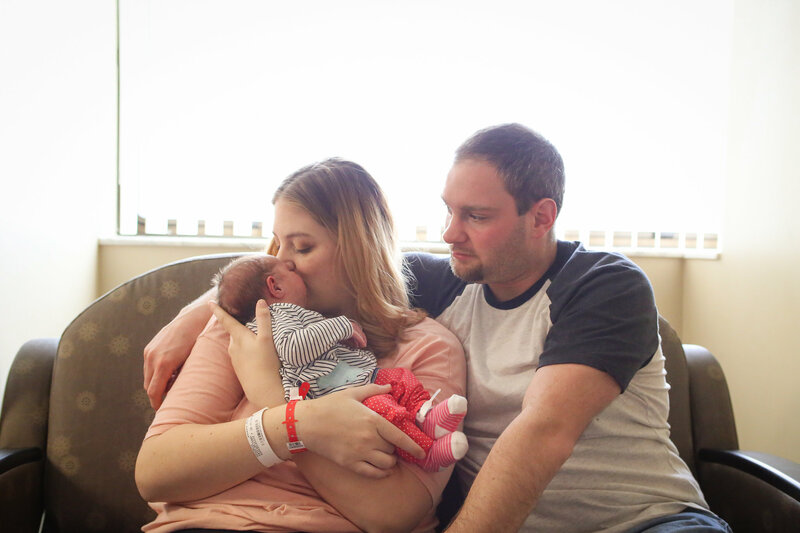 This budget doesn’t include pet items, pull-ups, or personal care items. We don’t eat any specific way, except we try to eat as healthy as we can. While I would love to purchase all organic items, that doesn’t fit in our budget. 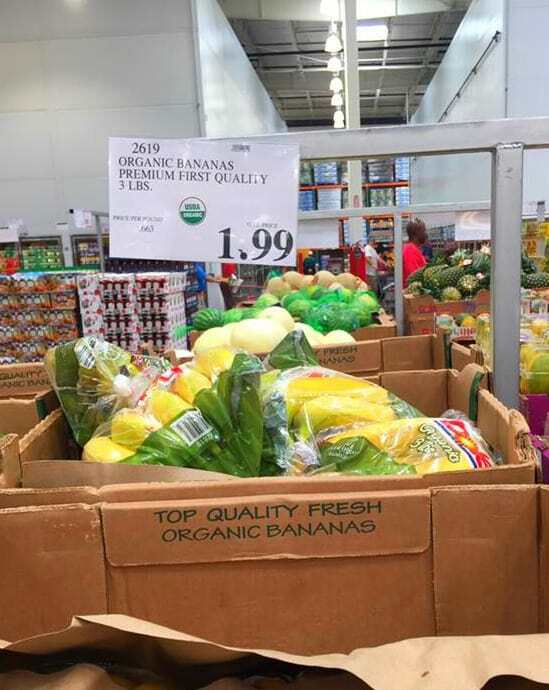 Organic Bananas: Costco sells prepackaged bags of organic bananas. Each bag is 3lbs and costs $1.99. That equals $.66 per pound! I buy three bags each time I go there. My kids love bananas. Water Bottles: The Kirkland brand of water bottles are sold in a pack of 40 for $3.39. It is a great price, even if you compare it to Wal-Mart! Honey: I prefer to get my honey from local sources, but I like to use Costco honey for baking. When you heat up honey, it does lose some of its natural nutrients and benefits. Costco has both raw honey and clover honey. Their raw, unfiltered honey costs $13.89 for 44oz. Maple Syrup: The last two years haven’t given us a great yield of maple syrup. We don’t use the fake syrup made of high fructose corn syrup. 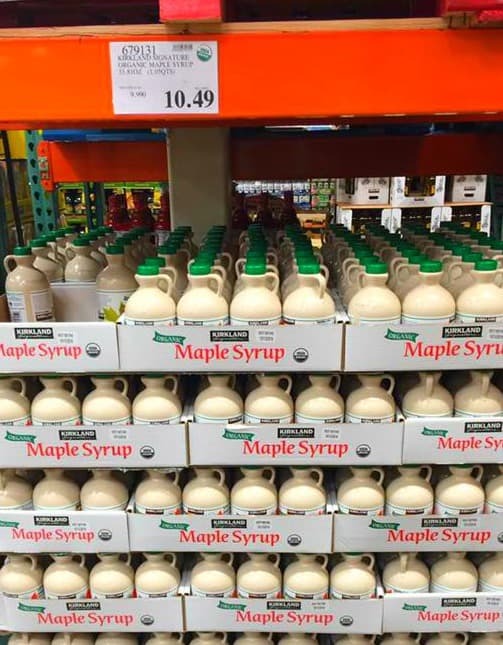 Unfortunately, maple syrup is very expensive in the stores. Costco sells a 33oz bottle for $10.49! You won’t find that price anywhere else. Romaine Lettuce: There are a few options for romaine lettuce available at Costco. One bag has 5 heads of romaine lettuce, and it is sold for around $3.50. We go through a lot of lettuce when it isn’t gardening season. Dog Food: I mentioned this before. We purchase a large bag of dog food that is grain-free at Costco. It is 35 pounds and costs $33.99. Before we found this deal, we would spend $35 on a 15lb bag of dog food. 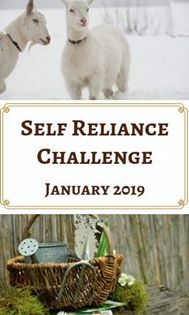 It saved us a great deal of money each month! Salmon Burgers: If you try to find salmon burgers at the stores, they are expensive. 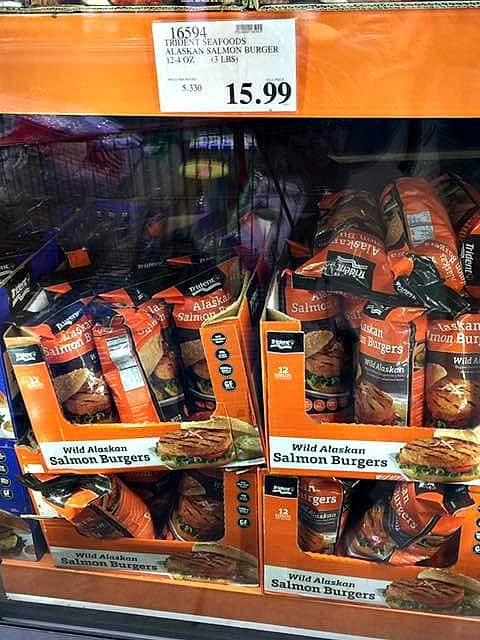 At Costco, I purchase a bag with 12 wild Alaskan salmon burgers for $15.99. This price might seem high, but Wal-Mart sells a box of 4 for $4. The kids absolutely love these, plus there are only a few ingredients! Lunchmeat: My kids love lunchmeat, but it is expensive to buy in the stores. Hillshire Farm sells a deli variety pack at Costco. You get oven roasted turkey breast, honey ham, and smoked turkey breast. It is priced at $9.99. That equals $3.30 per pound! Flour: I love to bake. Whether it is bread or cookies, I go through a lot of flour. 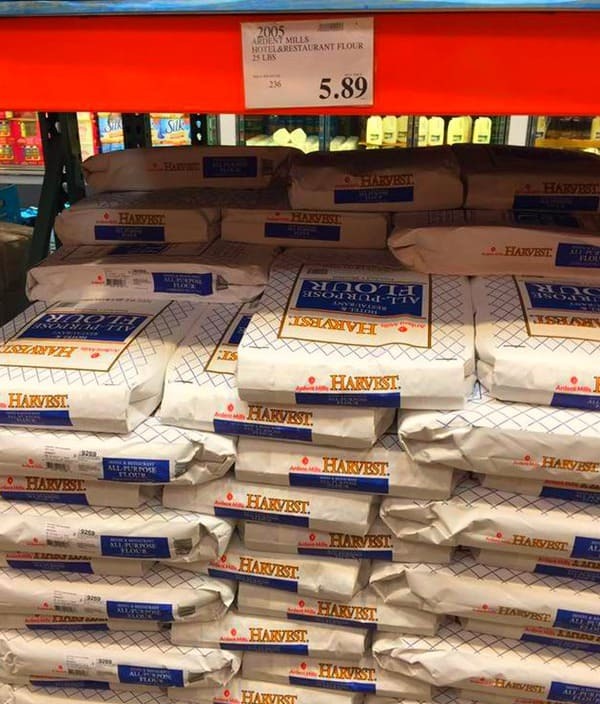 If you use all-purpose flour, Costco sells 25lb bags for $5.89, equaling $.236 per pound. You might think that somewhere like Aldi would be cheaper, but it isn’t! Aldi prices their 5lb bags of flour at $1.87, equaling $.374 per pound. 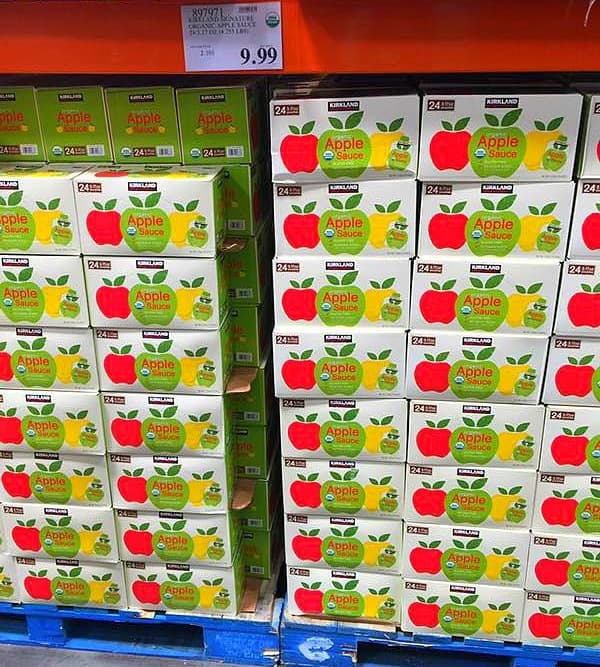 Applesauce Pouches: I tend to stray away from prepackaged items at Costco, but their applesauce pouch price is amazing. They make the perfect snack for the diaper bag. Kirkland sells 24 organic applesauce pouches for $9.99. Drawstring Kitchen Bags: Trash bags are expensive in the stores. 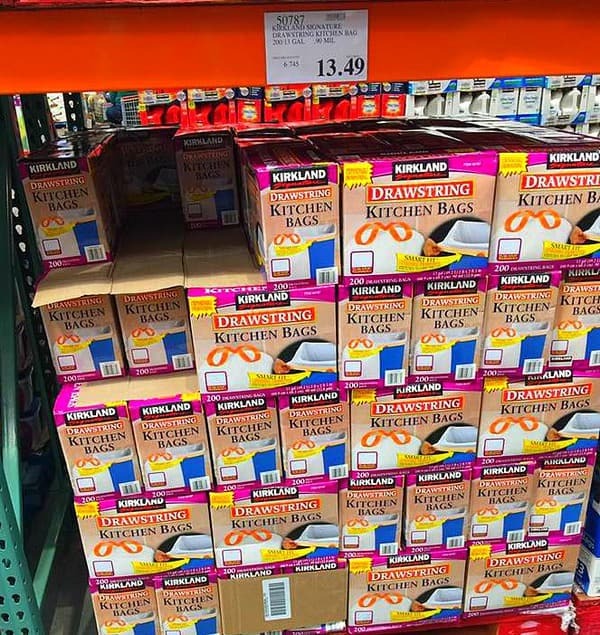 Kirkland brand bags cost $13.49 for 200 bags. Yes, you read that right! The box will last you a long while. Jones’ Sausage Patties – typically priced around $10.89 for 36 patties, with only a few ingredients. Whole Chickens – if my local store doesn’t have a good sale, I get them at Costco. Organic Ground Beef – when I can’t get it local, I always buy from Costco. Outshine Bars – my kids love these popsicles made with real fruit. They are typically priced at $9.99 for 24 bars! 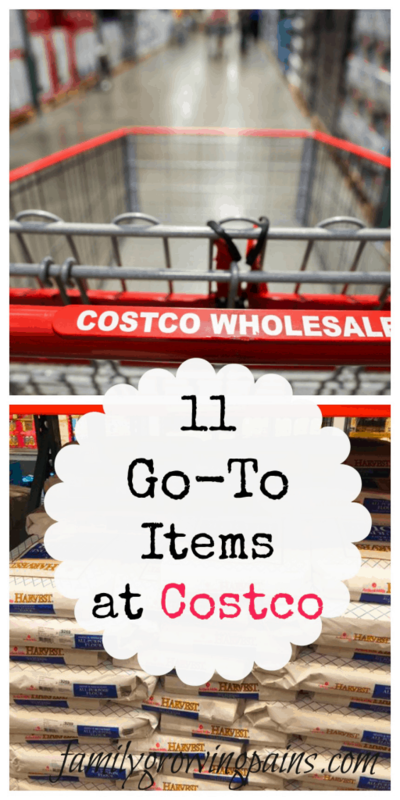 Are you a Costco shopper? If so, I want to hear YOUR favorite items. I love to pick up new things while I’m there. Don’t we all? Let me know in the comments!